January 7, 2018 My essay, A Funny Thing Happened Along the Cancer Journey, won honorable mention in the WOW-Women On Writing Winter 20172 Essay Contest. 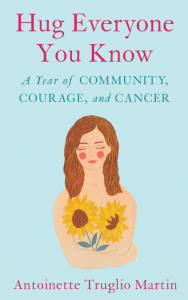 Excerpts are featured in my book, Hug Everyone You Know: A Year of Community, Courage, and Cancer. I earned my first 2018 payment as a writer—a $20 Amazon Gift Card! Big hugs and thank you-s go out to the hard working WOW staff and judges. You can read it on my blog.